So I generally avoid SL Controversies o’ the Day, because there are so many of them, and as fun as they might be to wade into, who has time? But a couple of different friends have now asked me about the “Red Zone” controversy, and whether they should be worried about it, or protecting themselves from it, or using it, or whatever, so I thought I’d contribute my answer here. The very short answer is: “No”. 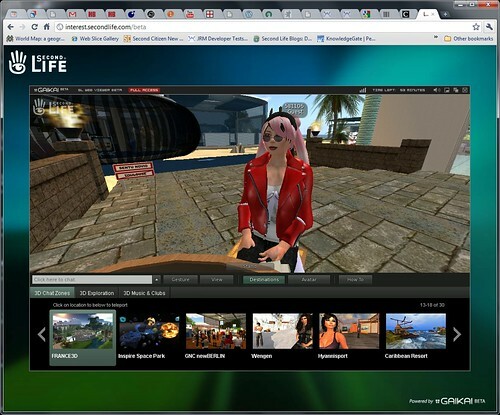 Red Zone, for anyone fortunate enough not to have heard of it, is a product (or these days apparently a line of products) in Second Life, that purport to protect you against griefers and “copybotters” (i.e. people using content-stealing clients), by (for instance) automatically ejecting them from your land. And (the special sauce!) also automatically ejecting their alts. Which means that it purports to know when one AV is the alt of another. It uses various heuristics to identify AVs who grief or use evil clients. The heuristics are necessarily approximate; even humans can’t agree on just what constitutes griefing or evil in a client, and even if we did have strong definitions it’s still hard and unreliable to detect just who’s crossed the line. And then it uses even shakier heuristics to guess who is an alt of whom. High on the list is trying to get the SL client programs used by nearby people (i.e. by you) to connect to an external website (via tricks with media URLs) in a way that will allow correlating the AV’s name to an IP address (that is, the address that a server sends data back to when you ask for it). This is relatively easy in most cases, because streaming media in SL doesn’t go through the Second Life servers at all; when you’re in a club listening to a live singer, say, the club sends just the URL of the audio stream to your SL viewer, and the viewer then directly connects to that URL (which is under the control of the singer, not Linden Labs) to get the sound. Now the fact that two AVs are associated with the same IP address is no proof that they are alts, of course. They could be two different people using the same computer, or two different computers that are behind the same firewall (some kinds of firewalls cause everyone behind them to appear to be at the same IP address, others don’t). Similarly, if two AVs are associated with different IP addresses, it doesn’t mean that they aren’t alts; someone really dedicated to keeping eir alts secret will just use them from different computers (or while causing the same computer to have different IP addresses, which is also possible). Red Zone may or may not do clever stuff to try to minimize errors from this sort of thing; doesn’t matter, though, as the alt-detection will still be approximate at best. So if I walk onto RedZone protected land, and someone who once used a computer in the same Internet cafe that my housemate once used once got on a blacklist for using an evil client due to a false-positive in some evil-client-detecting heuristic, I might find myself ejected. Similarly if someone buys some expensive Red Zone product and uses it to get a list of Dale Innis’ perhaps-alts, they might get a list that includes some of my alts, my housemate’s alts (if I had any housemates who used SL :) ), anyone that ever used a computer in the same Internet cafe as my housemate, etc, etc. Could be a long list! Since Red Zone uses streaming media URLs to try to identify alts, one way to avoid it is to turn off streaming media in your SL viewer, something that people do all the time for other reasons anyway. Some Red Zone fans and/or sellers have apparently suggested that Red Zone should, or does, detect people with streaming media turned off, and declare them griefers and/or copybotters also, since after all they are trying to evade Red Zone. Given all that, why is my answer to “should I worry about Red Zone?” a nice short “No”? If you find yourself ejected from some place because Red Zone has falsely classified you as the alt of a griefer, or because you had streaming media turned off, that’s not a place you want to be anyway. After all, it’s owned by someone fool enough to be ejecting people via Red Zone! If it seems to be a really nice place otherwise, you can bother to contact the owner, explain to them that Red Zone is silly and you aren’t a griefer, or you have media turned off because it crashes your machine, and see if they’ll override it and let you in. If they do, you’re in. If they don’t, they’re silly and you don’t want to be on their land anyway. If your SL SO rips into you because they bought a list of people Red Zone says are your alts, and that list included your SO’s bitter enemy, or an artichoke-fetishist, or whatever, patiently explain to them that Red Zone is silly, and those people aren’t actually your alts. If your SL SO trusts some random piece of drama-soaked software more than they trust you, the relationship was doomed anyway, and the sooner ended the better. Is Red Zone a violation of the ToS, or if it isn’t, should the ToS be changed so that it is? Is it a violation of any particular country’s laws, or of common decency, or the Will of God? Is the author a clever programmer, a scammer, neither, or both? Should Red Zone have been banned from the SL Marketplace? Should it have been allowed back in? If those questions interest you, feel free to dive in! There is for instance a humongous SLU thread (which I haven’t read) on the subject, a JIRA on banning RedZone, a more general JIRA about having more control over where one’s viewer loads media from (I kinda like that one), and on and on and on. And again, if all of that interests you, feel free to dive in! Lots of fun to be had, people to meet, flamewars to heat up or cool down, and so on. But if all of that bores you, and you’re just wondering if RedZone is something you need to worry about? Since I’ve mentioned Evony here before, I thought I ought to link to Bruce on Games on Evony, which reveals all sortsa interesting things about the game, including the fact that the curvy females in their ads are apparently ripped off from like lingerie catalogs, and the Evony owners are aggressively spamming all sorts of gaming-related venues to try to lure more players in. Silly in, I kinda suspect, the “advertisement thinly disguised as science” sense of “silly”. Background: some soi-disant analytics company published a glitzy paper full of cartoon diagrams, the major headline of which is that 40% of Twitter postings (more than any other category) are “pointless babble”. And oh by the way just mentioning in passing they are currently beta-testing (but I’m sure have no financial interest in) a new product designed to help people filter that stuff out (and here’s the URL to find out more). This is making lots of headlines (even here on th’ weblog, sigh), because of course people love to say either “Twitter sux0rs!”, or “does not!”. But in fact the study (and I use the term loosely) seems to have been designed to produce exactly this result, and therefore adds little or nothing to our knowledge of the world or of the suxiness of Twitter. In particular, any use of Twitter for the thing it was originally designed for, posting a brief description of what you’re doing right now so your friends can follow along, was presumably categorized as “pointless babble”. And then they got big headlines for finding out that there’s alot of that on Twitter.